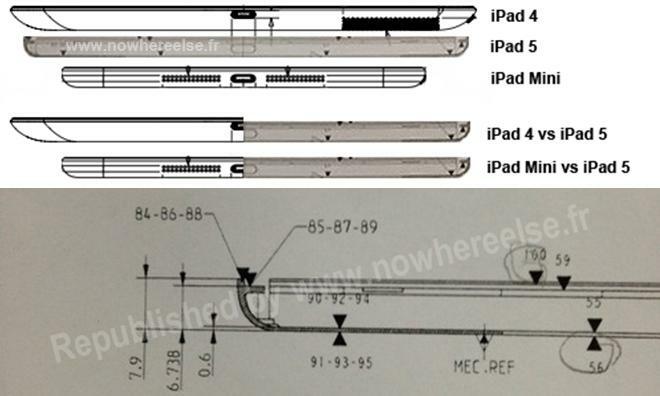 A new set of design schematics claimed to be for Apple's fifth-generation iPad show a design akin to the current iPad mini form factor. The documents, published by Nowhereelse.fr, show an iPad with a thinner profile than the current fourth-generation model. The unconfirmed drawings also show a next-generation iPad with a reduced width, presumably due to a thinner bezel outside of the 9.7-inch display. Aside from sporting a larger display, the design appears to be based on the current iPad mini design, complete with rounded off back corners and a new speaker location facing downward rather than backward. 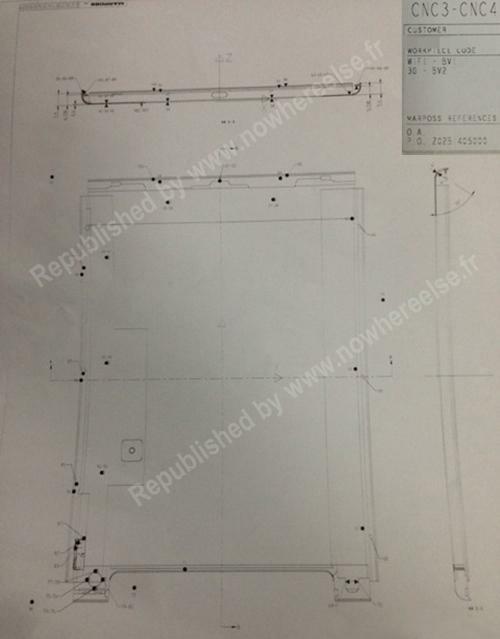 The document allegedly comes from an Apple subcontractor that is using the design to build the rear shell panel for Apple's next iPad. The schematics match up with earlier rumored details, leaked parts and third-party cases that have all been claimed to offer a glimpse at what Apple's next iPad will look like. The next-generation model is rumored to be 15 percent thinner and 33 percent lighter than the current fourth-generation model, and is expected to go on sale later this year. However, it should be noted that leaked schematics have appeared in the past, claiming to show the design of a next-generation Apple product, only for those documents to prove incorrect. Most notably, case maker Hard Candy ordered $50,000 worth of steel moldings in 2011 based on a bogus "teardrop" iPhone design blueprint that was available online.